Just Jingle: Seriously...could this bunny be any more adorable? I think not. Just say'n. Seriously...could this bunny be any more adorable? I think not. Just say'n. No. For reals. Even The Hubbums said that this was a GREAT bunny when I showed him this card. It is just TOO CUTE!!! He comes from the amazingly adorable Spring set from Unity. I love him. Just say'n. And...even better...this card is made entirely from my scrap bin! Yup! The only 'new' sheet is the card base, and actually, that was even the 'other half' left after making another card! I love using scraps in strips to create a washi tape style look and it was just too perfect to also use a simple scrap to create a loop to balance out the design! I stamped the image on a scrap of white stamping paper that had come from the remains of a piece used in the Grand Calibur and then stamped it again on a scrap of pink to create the pieced heart. YAY! I love using scraps! That's why I'm entering this card in the Paper Scraps Challenge in the Moxie Fab World! I usually fussy cut around my images, but for this one I decided to go with more of a halo cut so that I could be sure to include the grass and the light outline I had given the bunny. I really like this look...it's different and will only work with some images, but I think it worked out well for this card. It's fun to do things differently sometimes! Don't forget to check out my other post for today! It's pretty fun! Thanks for stopping by and don't forget to leave a comment! I do so love your comments! They make my day happy and I rather like being happy. Just say'n. In other news...we are going to see Chris Botti tonight. I'm kind of looking forward to it! Should be fun! Have any of you seen him live? Well, that's all for today! P.S. I know Blogger is throwing an error for some when you try to comment. If you would like to say something and can't do it here, feel free to leave a comment on my Facebook Page! All of your cards are so cute and zany! love it all! I agree, this bunny is SUPER cute! This kit was on my wish list for a long time, and I finally just got it and made a card last night with him. I love your "washi" scraps, great look! This is such a sweetie! Really glad that Blogger fixed the comment thingy. Your bunny is so adorable! 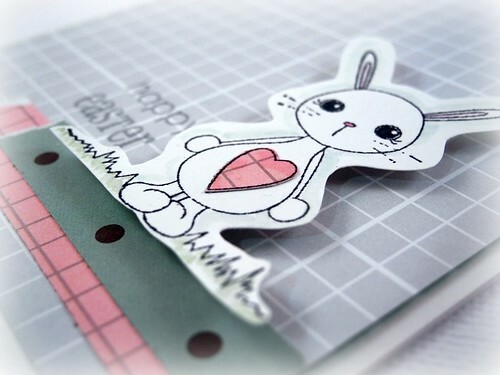 I am in love with this bunny too...very adorable....your card is sweet too! 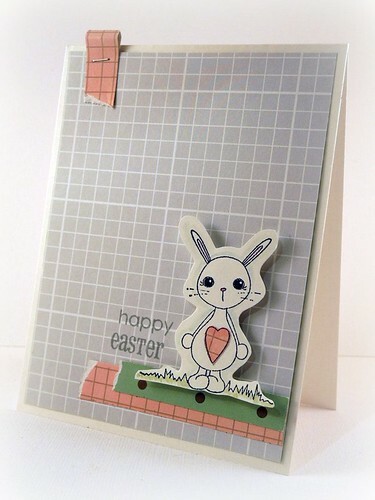 another super cte card~love the bunny!!! Super cute card, love how you used only stuff from your scrap bin. Very cute card. Love that bunny. So adorable and I love all those little pieces of scraps that balance it out so perfectly! That bunny is just too cute!! Love the card! Bunny IS pretty stinkin' cute! Just sayin'! Love the halo cut, almost looks like a diecut. Great card. oh that bunny is adorable!!! Just in time for Easter How cute is that card. YAY! Finally! Hope this comment goes through! LOVE that adorable bunny. He hopped right into my heart! Ah. That bunny IS precious. What an adorable bunny card! So so cute!! Love this!! I'm finally able to comment! Blogger was so messed up today! Darling- that bunny is so cute! Congrats, Jennifer on your Moxie Fab card! HUGE congratz on the Moxie Fab spotlight!! Again, awesome card!